As some of you may know, my company has been having a rough time of it with the economy. Last week, we received an email mid-week announcing that "measures" would be announced on Friday, i.e. layoffs, furloughs, and pay cuts. (What book of management is the "announce but don't announce and let people walk on eggshells for 2 days" idea from?) I was the lucky (and I do mean lucky) recipient of an additional pay cut. However, before I found this out, I really had no idea. So, I set about taking the time during which I would normally be working and cleaned out my office, just in case. I cleared out more than an entire shelf's worth of paper. My normal "filing" procedure is to stuff all project materials into a magazine file and forget about them. I was amazed at how much I could purge. Many of the magazine files are empty. I am going to try to be more conscientious of the paper I keep around. It really does become a burden that weighs on you. 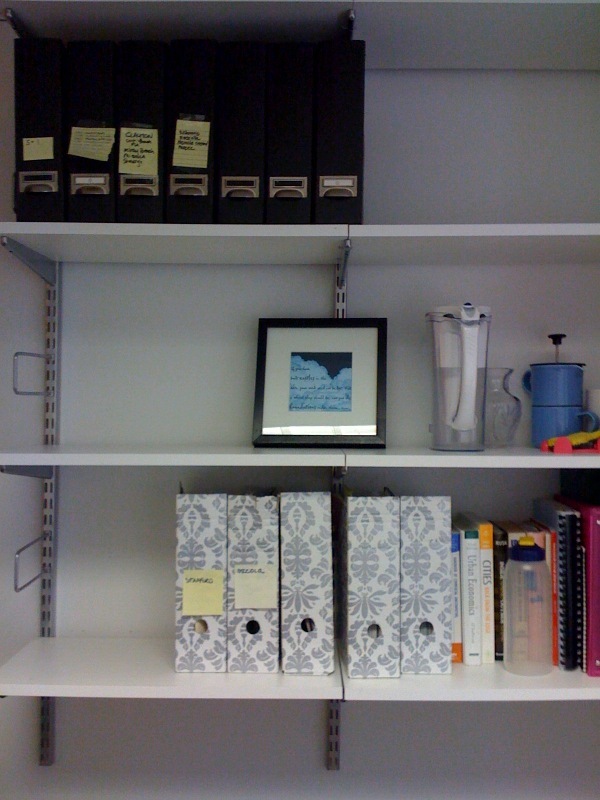 I am always impressed when someone can organize, and especially PURGE, paper and related items..bravo christine. I need to do this both at work and at home! Well, hoarding is one compulsion, and purging is another! I get a little bit of a "high" every time I do it! This was easy because 1.) I sort of had a deadline to get it done by and 2.) it wasn't personal stuff. It's a lot harder when it's sentimental! I'm really sorry that you have to take a pay cut, but glad to hear that you still have your job. This is the kind of thing that I keep hearing about, but isn't making it into the unemployment numbers.